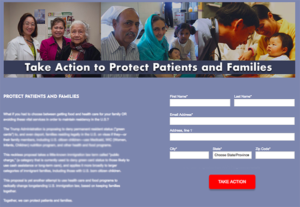 The Trump administration has issued a proposed regulation that expands the definition of “public charge” and puts the health and well-being of immigrant families at risk. The long-anticipated rule was published in the Federal Register on October 10, which starts the 60-day comment period for the public to provide feedback. The new rule would force immigrant families to choose between basic needs like health care and keeping their loved ones together. As representatives of America’s health centers and the 28 million patients they serve, we work to ensure access to quality and affordable health care for all in need. The health center model and mission is to ensure access to affordable health care so that all individuals can contribute to their communities and reach their full potential. As currently drafted, this proposed rule is in direct contrast to this mission. Remarks to OMB on Impact Of Proposed Public Charge Rule (June 29, 2018). Immigration Sample Policies and Procedures for Health Centers (California Primary Care Association – January 29, 2018) – Six sample policies and procedures for health centers to prepare for the unlikely possibility of an immigration raid. Know Your Rights Red Cards (Immigrant Legal Resource Center) – All people in the United States, regardless of immigration status, have certain rights and protections under the U.S. Constitution. These cards can be distributed to remind us of our rights in situations such as when ICE agents go to a home. AAPCHO works with its member Public Charge Task Force to advocate against any threats to the health and well-being of Asian American, Native Hawaiian, Pacific Islander and other vulnerable communities served at community health centers that would be disproportionately impacted by detrimental changes to public charge policy. Come back often as we update this page with the latest information and resources. If you have questions or would like more information related to the content on this page, contact us at public-charge@aapcho.org. The public charge comment period is now open. Submit your comment opposing public charge by December 10. 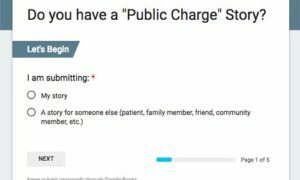 Do you have a "Public Charge" Story? If you, your health center, or community partners are seeing issues related to public charge and would like more information, resources, and/or assistance to address such issues, contact us.